With a number of farmers in my extended family, I have developed a great appreciation for the work they do. It never seems to end. Spring means snow melting, seeding and fertilizing. Summertime includes spraying, weather watching, rain gauge emptying (hopefully), seed shipping and more. Harvest dominates the fall as the race to get the crops off before the snow hits take on a sense of urgency. Sometimes the combines never stop. Winter should be a reprieve, but the farmers I know are busy preparing new land for crops, repairing and maintaining equipment (which is an ongoing operation on its own), shipping grain and preparing for spring and the cycle begins again. I don’t know if I could pull it off. The level of faith involved in being a farmer is amazing. Each year they invest heavily. Seed, fertilizer, fuel, equipment, and much more drains the bank account before there is any income. 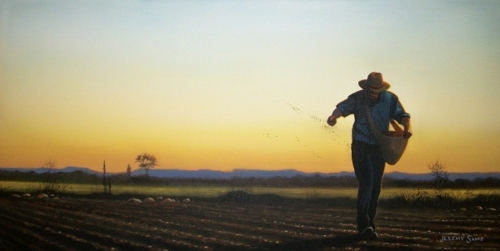 Once the precious seed hits the ground, there is not a lot the farmer can do to influence its growth. He watches the sky. Prays for the correct amount of sun and rain at the right times and entrusts the yield to the Maker of it all. Farming is definitely a faith business. But every good farmer knows his soil. He knows where the water pools in his fields indicating areas that are lower than others. He knows the frustration of rock and root picking in order to prepare the ground. He knows the prevalence of weeds and their ability to damage the yield of his harvest. He knows if his soil is fertile, too sandy, or full of clay. He knows what is best to plant so that he maximizes the potential of his soil. My Farmer knows my heart. He knows that the condition of my heart varies. There are times when my heart is a beaten path. When many feet have trod on it, pounding the ground with repetition. When my heart is like the path, I can hear the Words of Scripture spoken over me and nothing sinks in. My heart is too hard then to absorb the lessons I am meant to learn. Sometimes my heart is like rocky places. I mean well. I try to learn the lessons I am meant to, but there is no space for those lessons to sink their roots into my life. When things come along that steal my joy, the lessons of hope and faith I am meant to learn are swept away. Sometimes my heart is full of thorns. Other things move in, steal the space, divert the sunshine and rain, and profusely grow instead. Too often I let the thieves take root, take the place of importance robbing me of the abundant life that I am called to live. When my heart is a place of good soil, these are times I relish. Here the ground is fertile and the lessons the Farmer is teaching me are absorbed, mulled over, allowed to mature and develop. When my heart lies here, there is a fruitfulness in my life and ministry that is a result of His hand and power. In this Advent season, I pray for a constancy of heart. A heart that is a place of fertile soil. A heart that is able to follow hard after God and what He is doing in my life. A heart that desires Him more. A heart that is sensitive to what He is up to. A heart that joins Him in His mission and listens to His voice.